Salam & hello everyone! This is my first time hearing this brand name actually. It is called 4u2. I have done a lil googling and I found out this is a Thailand brand, correct me if I am wrong. They have all kinds of makeup products from powders to foundation and etc. So we are lucky enough to get our hands on this brand through Hishop.my. 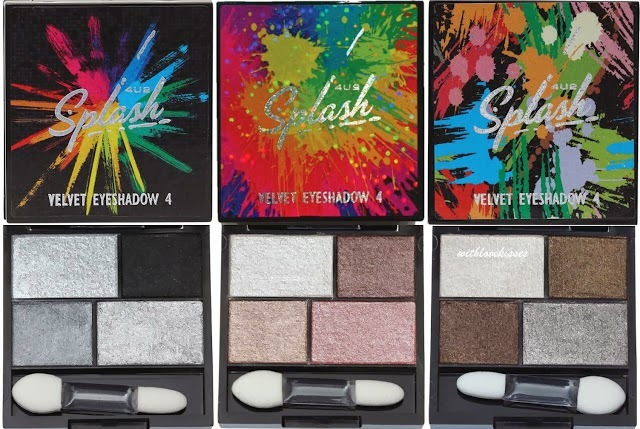 I will be reviewing the blushes too, for now on I will be reviewing this eye shadow quads first. This quad came in a plastic type of packaging and a stick on sticker on the face labeling. I find it look quite tacky tho and i find hard to differentiate it with my blush because they look the same., This quad contains 4 different color in it including a eye shadow sponge applicator. These quads also offers 3 different of color/style you can choose from. I got the one in no #1. As you can see the colors in this quad have a very matte black eye shadow and some sparkly shades in it. First impression, they look pretty good. After a few swatch I am quite impress with the matte black color first. The first color swatch from the left in above picture is quite chalky and it does fall out a bit. So I need to be careful when using that color. The others colors are okay to my opinion. The application of this eye shadow is quite okay too, it is not as rough as I thought it would be. The color pay off is super pigmented, points to that and it does not fade fast even without eye primer. This reminds me of getting the NARS duo in Pandora except it does not have a matte white. I find this quite a nice quad to bring around as the black matte color can be your eyeliner, and the silvery color can be as you highlighter on the go. Pretty neat. Have you tried 4U2 Makeup stuff? Hey, Sabrina! Hmm, honestly I never encountered this brand before but I do love the matte black. Can be both eyeliner and eye shadow. Seems pigmented enough for me. Nice! 4U2 Trademark is registered trademark of the Parent Company of Bel*Air Cosmetics Corp., USA. I think many of Thai people also think that it's a trademark from Thai company. the eyeshadow pic in th casing look very chalky! i feel like the eyeshadow powder isn't smooth too! yep, especially the glittery ones, but still controllable..